he passing away of the Most Ven. MahanayakaThera of the Asgiri Chapter, Aggamaha Pandita Udugama Saddharmakeerthi Sri Dhammadassi Ratnapala Buddharakkittabhidana Maha Nayake Thera on Wednesday, April 8 morning in Singapore, sent shock waves across the global Buddhist community. 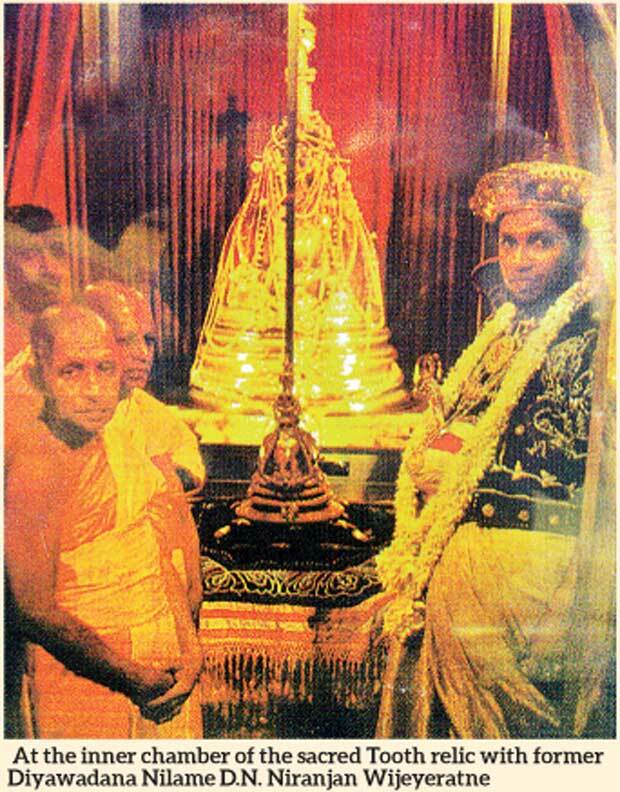 He was the 20th Maha Nayake of the Siyamopali Mahanikaya of the Asgiri chapter. The late Mahanayaka was born on March 17, 1930, at Udugama village in Wariyapola Kalugamuwa in the Kurunegala district and entered the order of Mahasangha as a pupil of Udugama Sri Buddharakkitha Ratnapalabhidana, a former Mahanayake Thera of the same Maha Viharaya. On July 21, 1945, he entered the order of Mahanayake and received his higher ordination at the historic “Mangala Upostagara” in Asgiri Maha Viharaya on June 12, 1951. Prior to entering the order of Maha Sangha, he received his primary education at the government school in Udugama. As a Samanera, he received his higher education at the Dharmaraja Maha Pirivena, Matale. Which means good conduct is the Order of the Disciples of the Blessed One, of upright conduct is the Order of the Disciples of the Blessed One, of dutiful conduct is the Order of the Disciples of the Blessed One. This Order of the Disciples of the Blessed One – namely, these Four Pairs of Persons, the Eight Kinds of Individuals – is worthy of offerings, is worthy of hospitality, is worthy of gifts, is worthy of reverential salutation, is an incomparable field of merit to the world. He tirelessly rendered invaluable and tremendous service to the Buddha Sasana. Also made noteworthy contributions towards social and cultural upliftment of the Motherland. In line of command, he showed great progress and achieved numerous high positions as a young Bhikku. In 1966, Buddharakkitha Thera was appointed a member of the prestigious “Karaka Maha Sangha Sabha”, of the Asgiriya chapter. 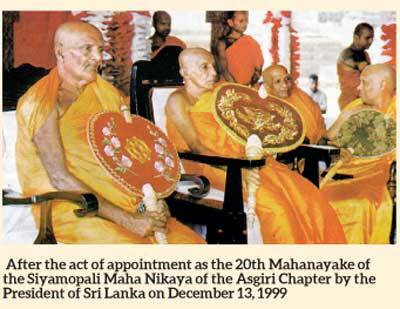 On December 13, 1999, he was appointed to the supreme post as the Mahanayake of the Asgiriya chapter. As a global missionary, he visited several foreign countries on numerous occasions at their instance. Korea, Thailand, Japan, India, Singapore, Taiwan, China, Tibet, Hong Kong, Burma and Cambodia are some countries he mostly frequented. 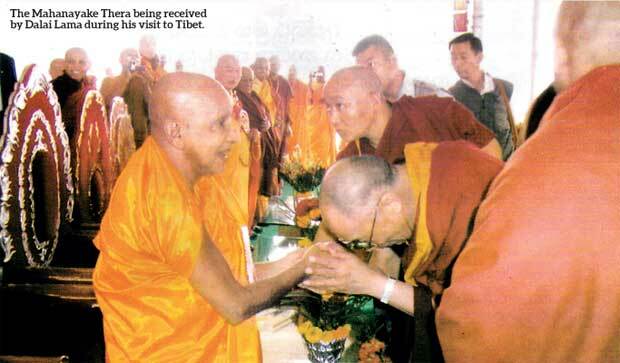 On March 7, 2007, in appreciation of his indefatigable and yeomen service despite his deteriorating health conditions, the government of Myanmar bestowed on him with the utmost prestigious title “AGGAMAHA PANDITA”. To coincide with the occasion, the Ambassador of the Union of Myanmar said in a message. “First of all, I would like to express my sincere wishes of personal well-being and success to the most respectful Venerable Udugama Buddha Rakkitha Thera. May I also be much respectful to him for his long years of dedication to the Buddha Sasana and I would like to express my highest consideration. As we believe in Buddhism and built together good relation and religious exchange between Myanmar and Sri Lanka since previous centuries, I would like to express some religious exchanges between our two countries. At present, the Venerable was presented with the religious title of AGGAMAHA PANDITA from Myanmar, which is an honour by our government in recognition of the Venerable’s contribution to the purification, perpetuation and propagation of Buddha’s Teaching. I am also very much pleased for such honourable title received by the Venerable Thera. As Myanmar monks come and study at various Pali and Buddhist universities in Sri Lanka, the Sri Lankan monks also undertake the practice of meditation in Myanmar every year. Regarding the relations between the two countries, Myanmar and Sri Lanka are steeped in history based on Theravada Buddhism. In the 11th century; during the regime of King Anawrahta of Myanmar, the sacred scripture Tripitaka was sent to Myanmar by King Vijayabahu of Sri Lanka. It may be recalled with gratitude that owing to the untiring efforts and the perseverance of the Bhikkus of Sri Lanka, that was made possible to produce the written Tripitaka, which was earlier preserved only through oral tradition. Since this time, there has been no turning back, and the two countries were intertwined with the golden thread of Theravada Buddhism. Being a humble follower this writer had close acquaintance with the late Mahanayaka from the childhood days. However, it is still amazing, significant and also hard to explain his benevolent nature. They were simple but deep in reality. He starts the day by worshipping the Buddha. He enjoyed offering countless jasmine flowers to the Buddha. It was somewhat a meditation he practiced daily and had even kept records of this meritorious act. He also consciously fulfilled his duties. He tirelessly rendered valuable and tremendous service to the Buddha Sasana and made noteworthy contributions towards social and cultural upliftment too. During his missions abroad he earned utmost respect from all bringing respect and hounour to Sri Lanka. People admired him for his distinguished conduct being an erudite and virtuous disciple of the Tathagata and an ideal Buddhaputra. Wherever the late Thera was present there was peace and harmony. He radiated abundance of inspiration with his calm and glowing smile and always symbolized loving kindness, compassion and vast transcend virtues. His doors remained fully opened for all, whether rich or poor, and made his bold comments fearlessly whenever the occasion demanded. The Mahanayake Thera indefatigably visited far and wide areas to oblige large number of requests and invitations and maintained friendly attitude towards all irrespective of class or creed. Illness and death are nature’s principles. However, only a few become fortunate to acquire positive merits by leading virtuous life engaging in meritorious deeds. Thus the passing away of this great prelate creates a vacuum in the human world. The Buddha had explained “The man’s body turns to dust; his name and influence persists”. This implies to the late most Ven. Mahanayake Thera for his everlasting saintliness. The government has declared April 12 as a day of national mourning and the state funeral will take place at the Asgiriya Stadium. May the Noble prelate attain the stage of highest perfection! why shock waves?we all have to depart from this dimension one day.